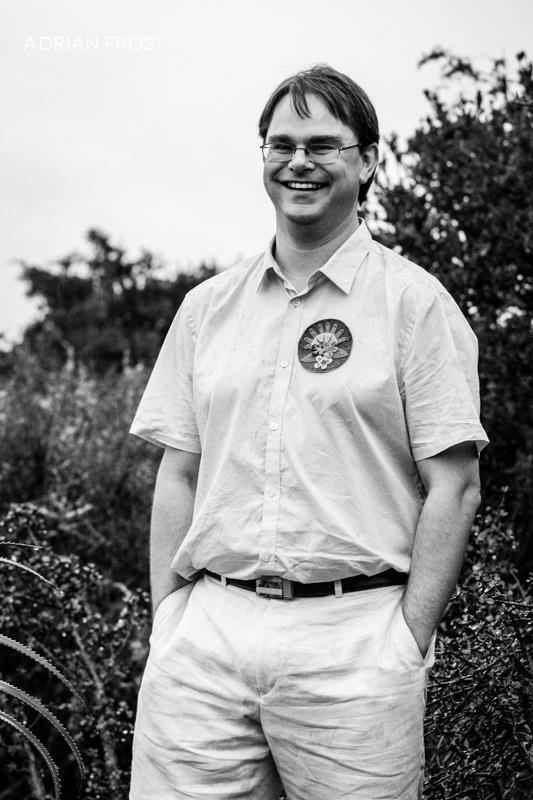 The following guest post is an interview with James Stapley, orchid care expert and fellow orchid enthusiast. Whether you have ample space to grow you orchids or are restricted to a very small space, I highly recommend you check out his orchid blog Orchids On A Balcony. 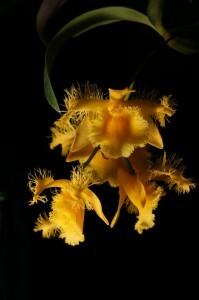 While you’re there, be sure to check out his great orchid photos! Ryan: So, tell us a little about yourself…What do you do for a living? James: I work for the Agulhas and Somali Current Large Marine Ecosystems Project, which is helping 9 countries in the western Indian Ocean region to develop innovative mechanisms to manage their marine and coastal resources in a sustainable manner, broadly through something called an “ecosystem approach”. My official job title is IT & Communications Coordinator, but that hides a variety of roles; I do anything from ship-based oceanographic work [actual science!] (a research cruise being considerably less luxurious than you might imagine), to IT (systems and network administration, helpdesk functions and any other “computer thing” that comes my way), to photography, to writing, to layout and design, education, writing, editing, proof-reading and pretty much anything else someone else isn’t in charge of that my boss decides needs doing. My background is in marine biology and fish taxonomy, but I spend more of my time wrangling computers and networks and writing about (or editing) what other people do than doing science myself. Ryan: How did you first get into growing orchids? James: Like so many people, my first introduction to orchids was definitely seeing Phalaenopsis orchids in florists and deciding I had to have one. I finally found one in Switzerland, where my grandfather lived, while I was in high school (probably in about 1995), and traveled back across Europe to London with it cradled between my legs in the footwell of the car. It then lived on top of my fishtank until I went to University, where it suffered an untimely end. (Because the friend I press-ganged into looking after it for me for a couple of weeks while I went on holiday to visit my family [who had moved to South Africa] forgot to take it home with him over the Christmas holiday. About 6 months later, we found it, brown, sad and dead in the cleaner’s closet). After that, there was a long hiatus; I bought my girlfriend at the time (now wife) a couple of orchids in 2008 from various florists and supermarkets (starting with… a Phalaenopsis! ), and then in Dec/Jan 2010/2011 we visited an actual orchid nursery. The latter event sent me into orchid overdrive; the back of our car was half filled with orchids on our drive home. After that, I ferreted out various other orchid nurseries around the country and ordered online, and the rest is, as they say, history. I like the challenge of growing something that is considered by most people to be “hard” and/or “exotic” – but as with so many things, I’ve learned if you either pick the right ones, or create the conditions they need, it’s not actually hard at all! The first thing I ever bought on the internet (1996 – pretty much in the days before things like SSL encryption caught on – I vaguely recall sending my credit card details in an email, which is a huge no-no these days) – were some orchid books from the American Orchid Society’s website, a general orchid book and a Phalaenopsis-specific one (as I had a Phalaenopsis). James: I have to pick just one out of over 20,000 species and 100,000 hybrids? Tough! Obviously, I’ve only seen a small percentage of all of those. I can’t even pick a favourite group of orchids; they’re often so different! 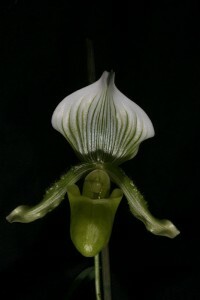 At a pinch, of the orchids in my collection, possibly a Maudiae-type Paphiopedilum which grows really well and throws out massively tall, really long lasting flower spikes. As a bonus, its foliage is attractive even when it isn’t in flower. I also like scented orchids; of the ones I have bloomed which are scented, it’s a toss-up between Lycaste aromatica and Maxillaria tenuifolia. The clone of Oncidium Sharry Baby ‘Sweet Fragrance’ I have, which bloomed for the first time this last year too, had a fragrance I wasn’t that taken with, it wasn’t as chocolate-y as I recall from sniffing another one; this was a pretty nondescript generally vanilla-y scent that wasn’t all that great. 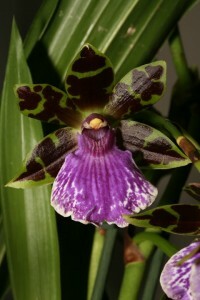 I can’t wait for one or more of my Stanhopea to bloom, and it would be nice if my Zygopetalum would stop sulking too! I really like Angraecoids (as a bonus many of them are scented too); my Aerangis rhodosticta var. luteoalba put on a really good show this year (first time flowering that) so I’m quite pleased with that at the moment. But its close neighbour, an Aerangis citrata, currently has about 7 spikes on it, and I imagine will look pretty great in a few months time! My Aerangis fastuosa is also really a great little plant, and it has a very strong jasmine scent. Sometimes too strong if you have to sit in a car with it for 3 or 4 hours! It’s actually easier to say what orchids I *don’t* like rather than the opposite; on the whole, I’m not a huge fan of gigantic hybrid Cattleyas; some of the smaller (mini) hybrids and many of the species are quite cool, but on the whole, they’re not my favourite. Of course, Cattleyas are many orchid people’s favourite plants, so this immediately makes me an outlier, or perhaps even a radical heretic! Ryan: How many orchids do you have currently? James: I keep track of types of orchids rather than numbers of them; I have several potted up keikis and seedling plants which I don’t count individually. Some of my plants are getting big enough they might benefit from being divided, but I’ll probably aim at making “specimen” plants from them. In terms of individual kinds, I try and keep the “Orchids” tab of my blog up to date; that tells me I have 77 types in my care at the moment, so over 80 individual plants. That page also notes the demise of 23 that haven’t done so well! I’d probably have a lot more than that, but my better half has strongly suggested I halt the impending takeover of our entire flat by orchids until such time as we have a house with a garden in which a greenhouse (and/or shade-house) can be built, and keep all the present ones alive and re-bloomed for several years. Ryan: Where do you grow them? James: The name of my blog says it all really – on a balcony! This particular balcony is fully enclosed with glass windows on 3 sides and has a solid roof. There is very little ventilation unless you open a window, and you don’t do that when you’re not home, because someone will climb in through it and steal all the things. During the summer, it’s often hotter outside than inside too, which rather negates the purpose of opening them. The plants are spread out on windowsills, a couple of tables, a long bench I built, hanging from curtain rails and on a bakers-rack type shelving unit. It’s moderately less chaotic than it sounds… Depending on whether or not a thing is broken, the area has variously automated heating, ventilation and lighting, and used to have humidification. I purchased a misting system, but it was suggested by my more sensible partner that using a misting system inside a house (even if in my mind the balcony is sort of “outside”) was foolish, so it’s not been deployed. Ryan: How many hours do you spend each day/week caring for them? James: The amount of time spent caring for the plants obviously varies, but it can be as little as 5 minutes a day (or none several days a week during winter). On average, probably about 10-15. Not all of that is “chores”, sometimes the bulk of that is just spent looking at plants, which is after all why we keep these things! In the summer I may water as frequently as 3 times a day, which I guess would bring it closer to an hour. Obviously if you’re repotting or doing something like that, it can take up quite a bit of additional time, but that only happens occasionally. 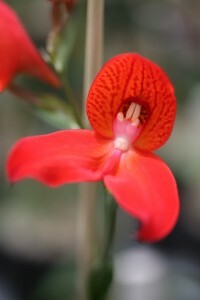 Ryan: Anything different about growing orchids in the Southern Hemisphere/South Africa? James: The most obvious one is the seasons are “backwards” (6 months early/late); this means you have to carefully interpret any growing advice which mentions a month (rather than a season). It also means that orchids which flower according to season do so in completely different months than they do on the other side of the world. South Africa doesn’t have nearly as many orchid specialist retailers as more “developed” nations (although the climate in many parts of the country means you can grow many varieties and species outdoors year round, so there are a few, and they can be pretty big). Still, we have a lot more than neighboring countries do, so those orchid fanciers look at us with envy! There are still a lot of very passionate orchid people here, and indeed, next year’s (2014) World Orchid Conference will be held here. The biggest orchid nursery in the country primarily grows Cymbidium orchids for the cut flower trade, but they also sell limited quantities of other plants, and do quite a lot of hybridizing amongst South African orchid species; they grow at least half a million plants under 4 hectares (nearly 10 acres) of greenhouses. This limited number of specialists can make getting hold of specialized orchid supplies or unusual plants relatively tricky, and there’s no way you’re going to get a cheap orchid off Ebay! Even if you do order a plant (or even something inorganic like fertilizer, specialized pots or growing media) from overseas you end up not only paying huge postal charges, but also various import duties (including on the postage…) which can be 40-60% or higher, making things 2-3 times more expensive that in the USA (and salaries here are much lower). “Cheap” supermarket orchids generally go for between US$15-$35 dollars, but you can often get more common species orchids from specialized nurseries quite a lot cheaper than that. And if you’re a member of an orchid society, I find people often just give you spare orchids, and “free” is a pretty agreeable price indeed! I’m quite lucky in that our orchid society runs a small shop twice a month that carries very reasonably priced orchid care products, although I have a couple of favourite things I can’t get from there. The other big difference is in exposure, i.e. North/South windows and light levels – that’s also “backwards”. If you want to maximize light in the Northern hemisphere, you pick a South-facing window; down here, it’s the other way around! Our balcony faces south, so there isn’t as much light as I might like, but that is really handy in the summer, or it would get intolerably hot in there (it’s pretty hot in there during the summer anyway…). We also get some morning and afternoon sun for much of the year through the east and west sides. James: If someone had to ask me what the single best thing you can do would be, I’m actually torn between three! 2) At least at first, choose orchids that suit your conditions. Don’t try growing cool growing plants on a hot balcony (or warm growing plants somewhere very cold! ), or a bright light plant when you only have dim light available. There is usually at least one type of orchid that will grow without too much trouble somewhere you have available inside or even outside your home. (1) comes in handy here – but there are several online sources of information like forums and blogs where you can ask questions; Orchid Board is a good start, as is some searching of the Internet with a search engine like Google. I don’t think it’s an exaggeration to say I’ve spent more on orchid books than orchids (and definitely more on books and equipment than plants), but you certainly don’t have to go this route; most “beginner” books are very inexpensive. That said, if all you want to do it grow a single Phalaenopsis, I have a post for that on my blog which costs you nothing more than your time to read, and there are many similar resources online too. Finally, don’t be too put off by the seemingly strange Latin names attached to most orchids either; it doesn’t take long to learn the more common ones (even my wife, who hates remembering “labels for things” knows most of them now), and it helps when you’re talking to other people about orchids to know what you have (particularly if you can’t show it to them!). Ryan: Tell us about your website. 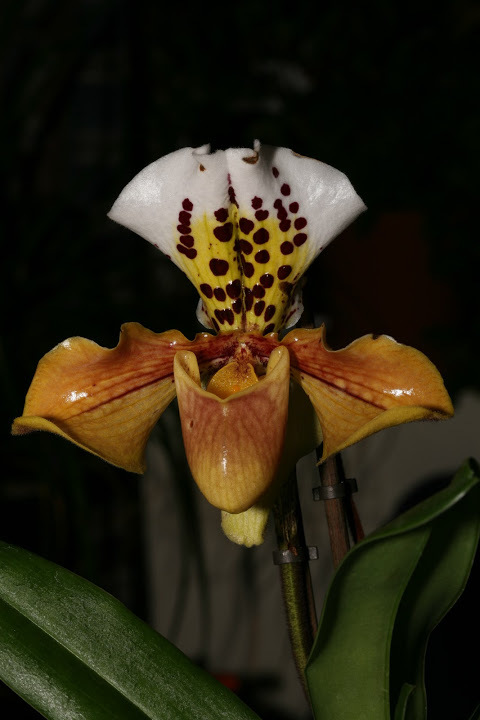 What made you decide to start your website blog about orchids? 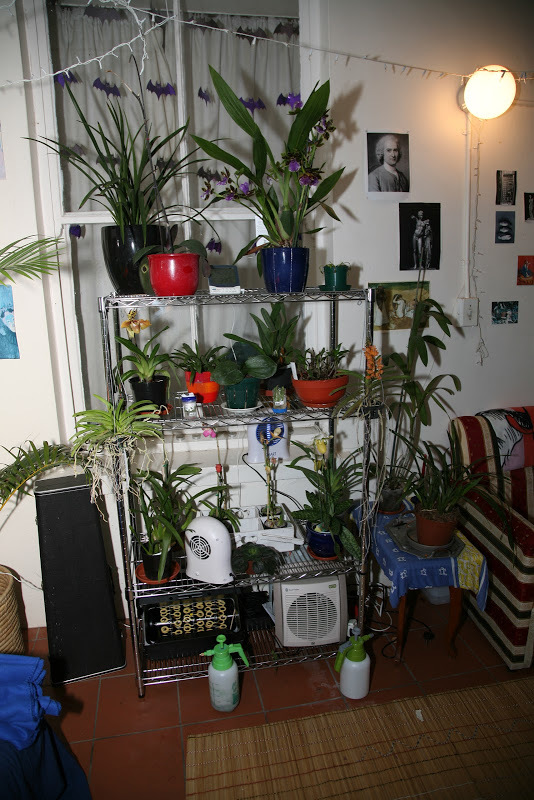 James: I started my orchid blog in January 2011, with 22 plants, 16 of them bought just a few weeks before that. I’ve long thought that blogs are a good way of communicating with people. When you have a hobby in which you’re really interested, you’re never quite sure just how much your friends and acquaintances actually want to hear about it; blogs are very handy in that people can tune in and out as they want to, and it’s really easy to share around the world too. Sharing my plants and orchid information as I uncovered it was one reason I started it; the other was to keep a record of the plants and how they grew over time; it also helps me keep track of what is going on – I find it easier to write a blog than to keep a notebook or diary of what’s happening to plants. Another is because I enjoy photography, and orchids make interesting photographic subjects, and a blog makes a good platform to share photographs from in a more formal way (i.e. as a story) that a photo sharing site like flickr or instagram. I quite enjoy writing, and have occasionally been accused of being reasonably good at it (on the other hand, one of my friends who works in journalism laughed out loud some years ago when I told her I now worked in communications). James: As a blogger, our greatest satisfaction is probably learning we’re not howling into the void – if you come across a blog post, don’t be scared to ask a follow up question, or even for some advice. Most bloggers are more than happy to engage with their readers! So, next time you read a blog, think about posting a comment. :) Also, most blogs link to other blogs, and if you found the first one interesting, you’ll probably find the other blogs they list are interesting too – so try a couple of links too! I think the single trickiest thing to learn in orchid culture is probably watering; each group of orchids and each type of growing medium, pot, season, country and even each position in a home has a slightly different “optimum” level. The sooner you learn what yours is, the better your success with orchids will be. In between wrangling computers and fish and other more mundane happenings, James Stapley blogs about his experiences of growing orchids on a balcony in a little town in Africa at www.Orchids-On-A-Balcony.blogspot.com. Aside from orchids, the balcony is also host to quite a lot of succulent plants and a number of carnivorous plants. Occasionally there is enough room for a human being or two to sit down and admire the view – but only when the fans are off.